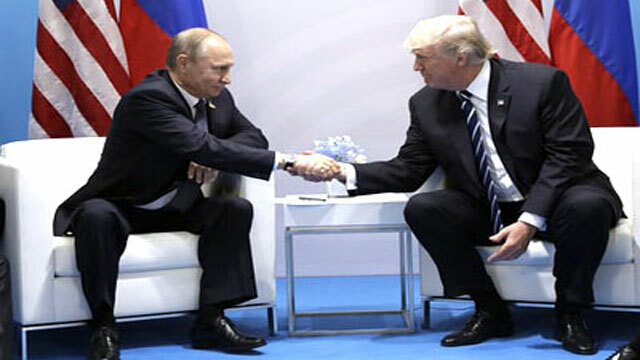 M Mushfiqul Fazal from Hamburg, July 7 (Just News) : President Donald Trump and Russian President Vladimir Putin have concluded their first, highly anticipated in-person meeting since the U.S. presidential election. The meeting, which was expected to last just 30 minutes, lasted two hours and 16 minutes, according to a senior adviser to U.S. Secretary of State Rex Tillerson. In the meeting the US leader told Putin “It is an honour to be with you” and Putin replied: “I’m delighted to meet you personally, and I hope our meeting will bring results.” Phone conversations were “never enough”, he added. The both leaders will spend about half an hour time, according to official sources. President Trump said “We look forward to a lot of very positive things happening for Russia, and for the United States and for everybody concerned. And it’s an honor to be with you, ” he added. “We’ve had some very very good talks. We're going to have a talk now and obviously that will continue" said President Trump. As Putin spoke, Trump looked directly at him and sat with his hands clasped. Trump and Putin shook hands. Several reporters in the room asked Trump if he would raise Russia's election meddling. He heard, but ignored the questions. Before their high-stakes sit-down, the two leaders had a casual run-in this morning where they exchanged a handshake.